Charges of animal cruelty have been laid against a Vanderhoof resident after BC SPCA constables seized 25 shepherd- and terrier-type dogs and 21 cats from his property. 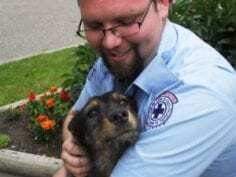 The sick and badly neglected animals, who were seized on June 23, were cared for at the North Cariboo (Prince George) and Vernon branches of the BC SPCA and adopted into loving homes. “We do have a history with this particular individual, Maurice LaPointe,” said BC SPCA special constable Debbie Goodine, who led the investigation. “When we attempted to inspect the property to check on the animals we were denied access so we obtained a search warrant.” SPCA officers executed the warrant and discovered a large number of malnourished dogs and cats in poor body condition and suffering from numerous untreated injuries, internal parasites and other health issues. “The dogs were contained in four outdoor pens constructed of logs in a vertical position which posed a risk of injury or death to the animals,” said Goodine. “They were obviously malnourished and did not have adequate water or shelter.” She adds that the pens were filled with feces and that pack aggression was evident during the warrant due to overcrowding in the pens. The BC SPCA conducts nearly 6,000 cruelty investigations a year and is reliant on donations from the public to continue its work. The Heroes Fund for Animal Protection rescues, protects and investigates animal cruelty. Your gift can help bring abusers to justice. Please donate today. Photo caption: North Cariboo SPCA staff member Ryan Manning, with one of the 46 animals seized from a Vanderhoof property.